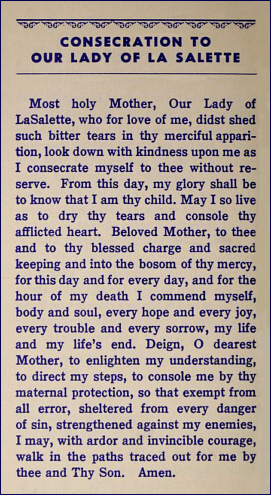 Extracted from the booklet: "The Apparition of Our Lady of La Salette" 5th ed., p. 20. Published by the National Shrine of Our Lady of La Salette in Ipswich, Mass., 1955 Imp. "The Shrine of LaSalette is of great authenticity and is destined to have a future. "there will not remain any vestige of the Holy Sacrifice..."
3. Is a New Perfidious "Sedevacantist Type" Sect Emerging?